The GOLD PRICE rose $2.60 to $1,094.00 on Comex while SILVER scraped off 3.1 cents to $14.683. GOLD/SILVER RATIO rose 0.5% to 74.508 oz of silver to one of gold. Not even a nat’ral born durned fool running his loose jawed mouth at top speed could find anything to say about that. Silver and GOLD PRICES are trading sideways, in a downward trend. Until they either break down further, or signal an undeniable reversal up, ’tain’t nothing to say. Silver and gold prices need to post some sort of reversal day: a spike down with a higher close, or a big one-day jump. I doubt they’ll sneak up off these lows. True, the gold/silver ratio did rise today, but yesterday it nearly touched the 50 day moving average below (73.45). Today it cut into the 20 DMA above (75.15), but closed well below it. So far it doesn’t threaten to rise significantly. Stocks took a big hit and have now erased all the gains of the last eight days. (I am manfully resisting the temptation to say those hateful words, “I told y’all so.”) Dow Industrials lost 119.12 (0.67%) to close at 17,731.92. S&P500 stumbled 12 points (0.57%) to stop at 2,102.15. Dow has ducked under its 200 DMA (17,744) again, although the S&P 500 has only today closed below its 50 DMA (2,102) and remains way above its 2,063 200 DMA. Momentum indicators have rolled over away from heaven and toward the dirt. US dollar index resumed its earthward flight today, losing 50 basis points to 97.23. This only breaks the short term uptrend and as yet says nothing about the intermediate trend. Euro rose 0.54% to $1.0986, but looks pukin’ sick as a hound eatin’ poisoned meat. It might be promising to turn up, but it has no more credit left than a politician, so will have to put some money on the table rather than promise. Yen keeps moving sideways to slightly higher. Up 0.075 today to 80.73. West Texas Intermediate Crude broke down out of a flat bottomed triangle, but only 0.73% so far, to $48.85. Copper dropped 2.10% to a new low for the year at $2.36. 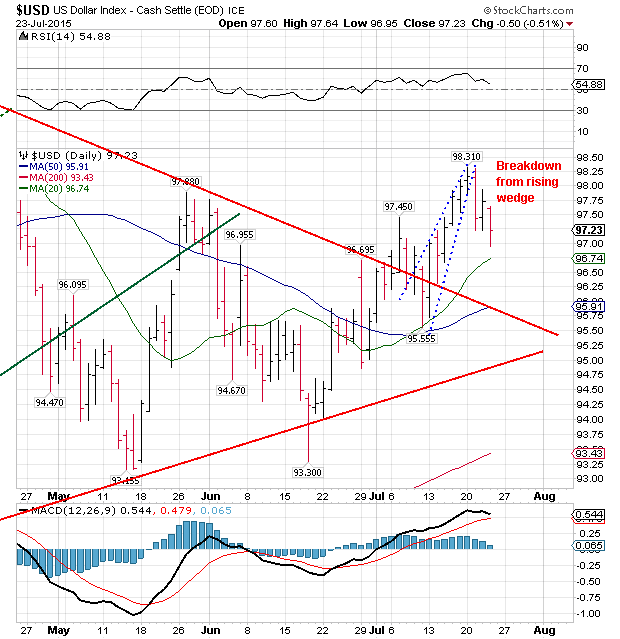 Bloomberg Commodity Index dropped out of a falling right triangle, too, by about 1%.